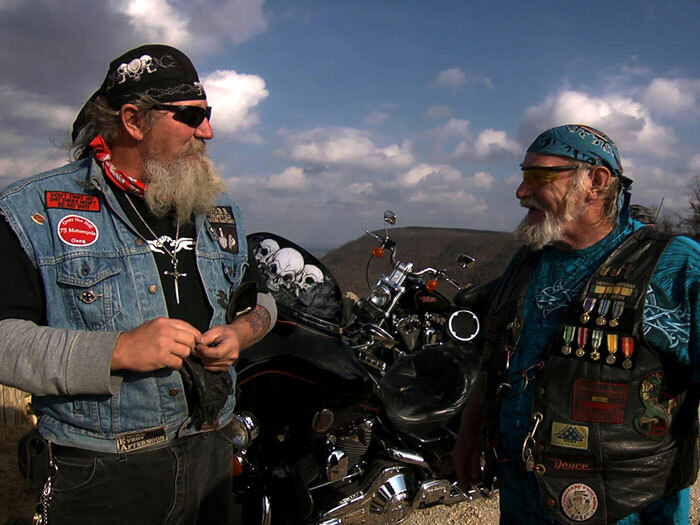 Returning to the Ozarks, Debra Granik (Academy Award® nominee Winter’s Bone) turns her lens on Ron “Stray Dog” Hall, a burly, aging veteran who manages an RV park and rides his motorcycle cross-country. Shot over three years, Stray Dog is a humanist portrait of an extraordinary man forever changed by two tours of war. Through his relationships with his fellow vets and his loving wife Alicia, Ron finds the courage to confront his past (from which he still has nightmares) and the courage to keep going. Granik breaks down the stereotypes of a community united through remembering and adapting to a changing America. How do you describe Stray Dog in your own words? 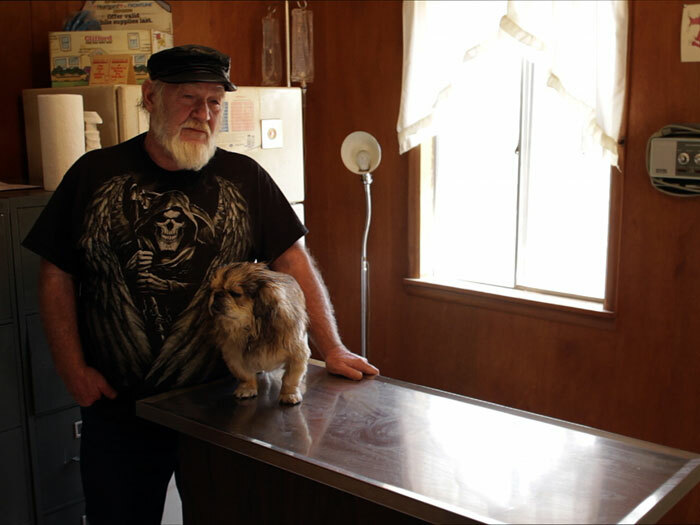 Debra Granik: Stray Dog is a portrait of a working class man living in the Southern mid-west. His life and times have spanned events and eras that connect to many of us and the experiences we’re navigating in 2014 America. For us, he’s a compelling guide—forthcoming, and laced with thought-provoking contradictions. This is why we decided to follow and record moments in his existence. The film is also a family drama in which the yearnings for survival and thriving and making peace with things one has experienced in the past link to front and center themes that we all confront in contemporary America. And it’s a rough-hewn look at a man from a specific time and place, and how the past several decades of American history have marked his life. What inspired you to tell this particular story? How did you learn about Ron “Stray Dog” Hall? Debra Granik: We met Ron in the making of our previous film, Winter’s Bone. In a brief visit to say good-bye, we met up with him in his real-life home, meeting his friends and neighbors as well. He told us a about the upcoming cross country veteran biker ride to DC, as well as issues that concerned him. Filming a few days with him, as a sort of a test shoot, is what gave us the feeling that we could create something with him, learn more about him and his experiences. There were a number of themes in his life that were rich, loaded, and unexpected to us. You can see someone in a setting and make assumptions about them, but it is not until they start to tell some anecdotes and explain some connections that you start to see an interesting fabric. Ron is also a natural storyteller. We learned that some of his stories he uses as icebreakers, as a way to meet someone he doesn’t know—a kind of regional generosity that he extended to us. You followed Ron for over three years; how did the scope of your film change over time? How did you know the film was complete and it was time to stop filming? Debra Granik: With an ongoing story in a real life, I find it very difficult to know when to stop. In this case, we had to make an end-point by virtue of Stray Dog living quite far away and the reality that the story would twist and turn for a long time. Did we entertain dropping back six months later—yes. Did we film some additional material to show changes over time—yes. But then after 230 hours of footage, we had to scale back to what is watchable and absorbable within a conventional running time. Were we tempted to make more of a mini- series with different chapters—yes. Did we take that plunge? Not yet. Most people will know you from your work as a fiction filmmaker (Winter’s Bone, Down to the Bone). What made you decide to tackle a documentary this time around? How was the process different for you? 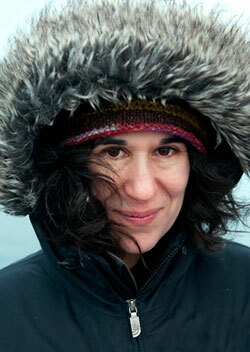 Debra Granik: On the pragmatic level, a documentary is much easier to start. We didn’t need anyone’s permission and we didn’t have to wait for approval of our ideas. With a documentary you have so much more time to observe and learn through reviewing the footage in the time between the shoots. You get a much deeper understanding of day-to-day life and its themes. It’s also much more of a mess after three years; you have to comb it out carefully and see what fits together and makes sense. There can be a big difference in the lines that get spoken in a doc and a narrative– from the dialogue, the asides, the possibility of a poetic internal monologue (voiceover). As Tory (the editor) and I look at the footage, I think, Oh, that I could write like that! Ron and his friends deploy humor to keep life interesting—badass humor, good humor, Ozarks humor. Often we loved the lines that came out of his mouth and those of his friends, but we ourselves can’t write lines like that. There were things about him—his swagger, his friends’ swagger—that were really appealing and photogenic. They were colorful personalities and had unfamiliar habits: what they wore, how they cooked, being insightful, searching, and at other times intimidating. Who can script that spicy array? There is a porous membrane between a documentary that doesn’t use interviews and what one might call a neorealist hybrid film. Many of us are searching for vocabulary to convey the intersection between doc and fiction. Some differences are clear. In doc making, many images and events that one cannot predict leap in front of your lens. This onslaught of curious and poignant moments can make you wonder if there will ever be a way to put the pieces together into anything coherent. And then, for as many moments that you “catch” or record, there are many that you miss. And if you miss something, you can’t just do a re-take. And at those moments, I think, If this was a narrative, I could try that again. There were many incidents and stories that I didn’t “capture” that I had difficulty letting go of. One that comes to mind was the day that Ron had performed mouth-to-mouth CPR on one of his little dogs. After the fact, we spoke to him, and he was very happy because the dog had survived. From a photographic perspective, seeing this big guy perform mouth-to-mouth resuscitation on a small dog was something I knew I would find strong, if not a little surreal. It really ate me up inside that we had missed it. We tried to have him show the CPR technique to his family, and it didn’t work. In some cases, you can direct in a doc; other times, you think you can, but can’t. Step one: accept fate, which can be hard to do. Do you have one piece of advice for aspiring filmmakers, either documentary or narrative? Debra Granik: Find dependable colleagues with whom you like thinking alongside and collaborating. Films really get done by close-knit teams. It’s very rewarding to enjoy the process as much as possible, not just the result. We all exist in a very end-product culture, so it’s easy to lose sight that the collaboration also enriches your life. What do you want HIFF audiences to take away from your film? Debra Granik: That so little is black and white. There’s usually an AND in most traits and behaviors. Someone can be something or someway AND be something contradictory. Discovering the AND is a realization that makes life messy and engaging to decipher. If there’s a takeaway from the film, it’s about the long-term costs of war. After the financial drain of years of war, and after the people at the top of the pyramid have made their billions, there’s a generation of soldiers who are left holding the bag on the emotional and psychological fronts. Like lots of other filmmakers, I feel it’s important to keep this awareness in the forefront, in service to staving off historical amnesia. On the lyrical and optimistic side, I’d like to share my affection for the unexpected of how new families form and the positive changes that do happen in our American lives. I’d also like an audience to take away a couple laughs, as I did. Ron embraces humor as a coping skill. As someone with a scrappy existence, a survivor, who doesn’t have a lot of cushions, Ron and his friends and family have to make the sweeteners themselves. Stray Dog will screen in the World Cinema program at HIFF 2014. Find tickets. Debra Granik is the Academy Award-nominated director and co-writer of Winter’s Bone, which was nominated for four Oscars, including Best Picture, and Best Adapted Screenplay. The film also the Grand Jury Prize at the 2010 Sundance Film Festival. Granik’s first feature film, Down to the Bone, won Granik the Best Director prize at the 2004 Sundance Film Festival.